BRIEF SUMMARY: Fullmetal Alchemist takes place in an alternate history, in the fictional country of Amestris. In this world, alchemy is one of the most-practiced sciences; Alchemists who work for the government are known as State Alchemists and are automatically given the rank of Major in the military. Alchemists have the ability, with the help of patterns called Transmutation Circles, to create almost anything they desire. However, when they do so, they must provide something of equal value by the Law of Equivalent Exchange. The only things Alchemists are forbidden from transmuting are humans and gold. 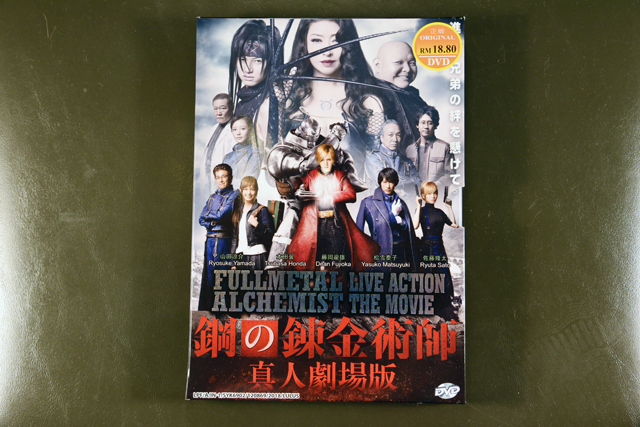 The story focuses on two alchemist brothers, Edward (Ryôsuke Yamada) and Alphonse (Atom Mizuishi), who lose their mother at a young age and nearly destroy themselves trying to bring her back. Alphonse loses his body, and his soul is transferred into a giant suit of armor. Edward loses his arm and leg and gains the ability to transmute without a Transmutation Circle. They both grow up to be talented alchemists with the ability to shape elements in the world around them. Together with their childhood friend/mechanic Winry Rockbell (Tsubasa Honda), they search for the Philosopher’s Stone, which has the power to restore the bodies they lost, while uncovering a diabolical military conspiracy.